The area with the most concentrated office buildings in Singapore CBD is Raffles Place, which is also commonly known as the financial hub in Singapore. 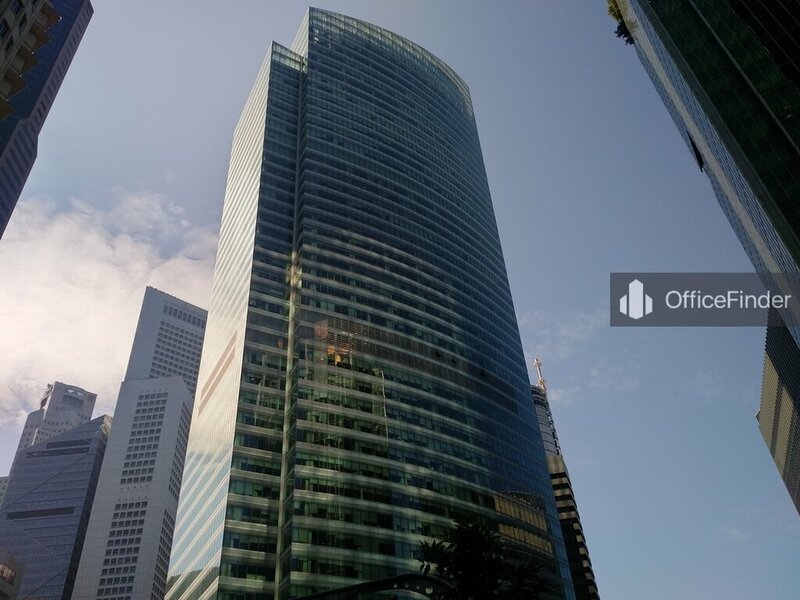 Office space near Raffles Place MRT station is the most sought after by businesses, especially MNCs. 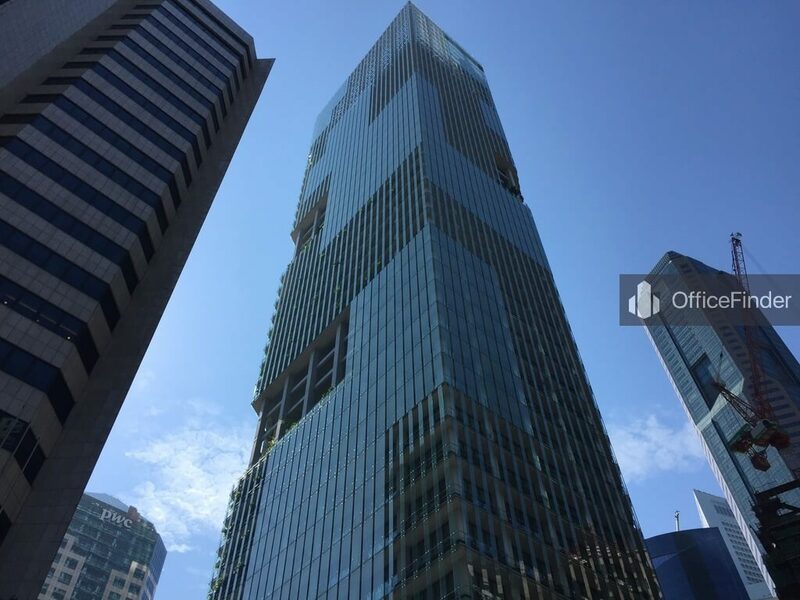 Because of their highly prestigious business address offer, within the CBD, firms like banks, service offices, financial institutions, insurance companies, firms offering professional services and new media companies crowd the Raffles Place area. Being the financial core of Singapore, Raffles Place has some of the tallest buildings and landmarks in Singapore. 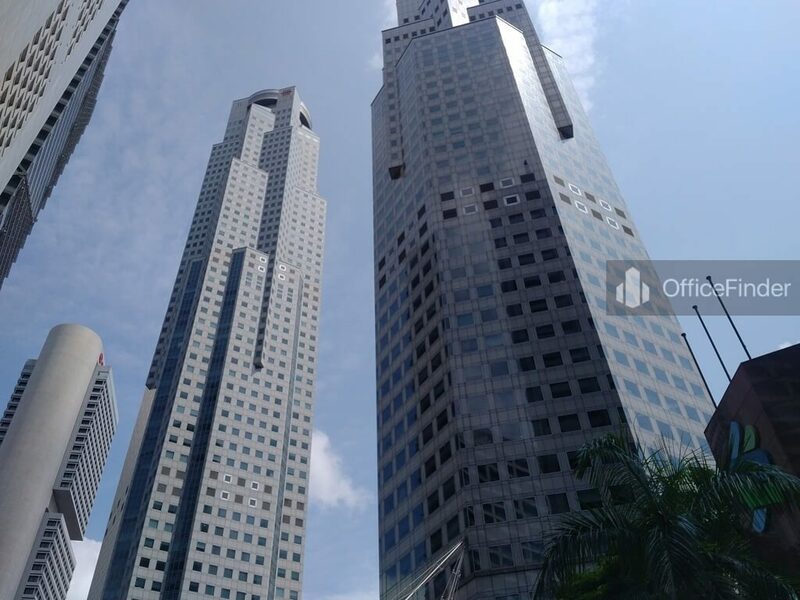 The three tallest office buildings in Raffles Place are namely One Raffles Place Tower 1 having 62 floors, Republic Plaza with 66 floors and UOB Plaza I consists of 67 floors. All three buildings have an equal height of 280 meters and are ranked 123 among the tallest building in the world. 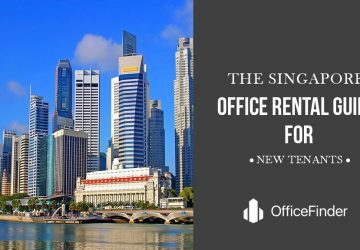 Although rental rates of Raffles Place office space are one of the highest in town, it offers a wide selection of rental office spaces that cater to businesses with different rental budgets. 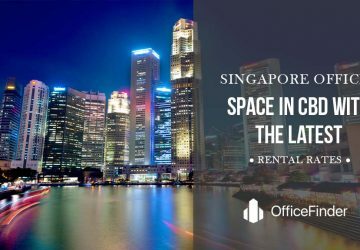 With lower rent in some of the smaller office buildings starting at $6.00 per square foot, it is almost impossible not to find a suitable office space in Raffles Place for any business. Raffles place house notable Grade A office buildings like Ocean Financial Centre, Six Battery Road, One Raffles Place, Bank of Singapore, MYP Centre, 20 collyer Quay and Republic Plaza. Located right next to Raffles Place is Boat quay, an iconic belt of shophouses with excellent bars and dining options fronting the Singapore River. It is the most popular after hour hang out destination for those working in office space near Boat Quay. Located underground, right at the heart of the commercial hub of Raffles Place is the Raffles MRT station. The station is an interchange of the East-West Line and North-South Line. 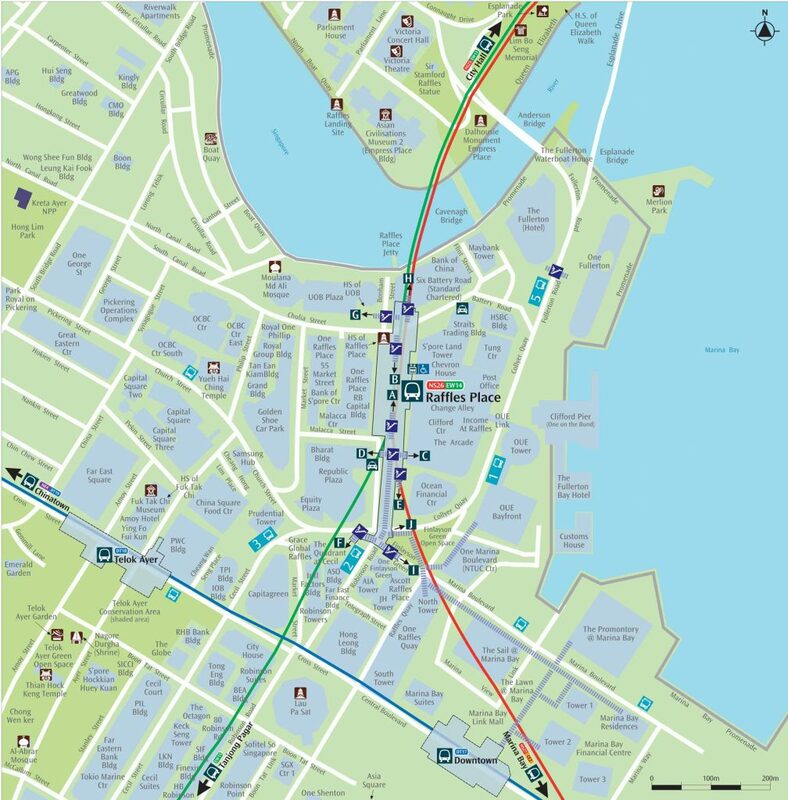 It comprises 10 exits with underground linked way connecting the station to most of the major office buildings near Raffles Place. 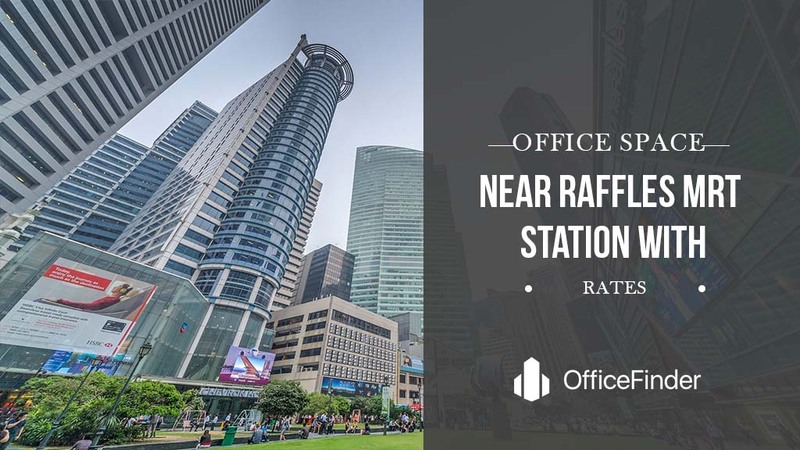 With the complex underground linked way from the Raffles Place MRT station to the office buildings around it, it can be a daunting task for someone to decide where to locate the new office space near Raffles Place MRT station. To overcome this, we have group the office space near Raffles Place MRT station into two, with the first group consisting office space in the heart of Raffles place and the other on the fringe of Raffles Place MRT station. This table provides the average monthly rental rates of office space near Raffles Place MRT station. 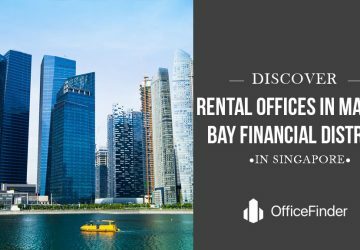 You may use the rates to estimate your monthly rental budget for a Raffles Place office space using the average rental rate of respective building in the table multiply by the required floor area. The data in this table is for reference only. We suggest you consult a real estate professional before making a transaction. 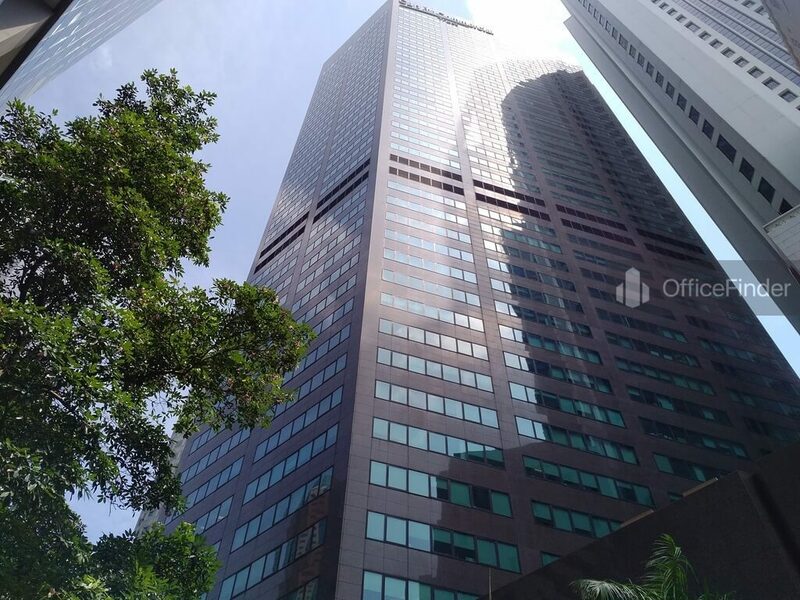 There are a total of 18 office buildings located in the heart of Raffles Place bounded by Singapore River, Market Street, a short portion of Church Street and Cecil Street, and collyer Quay. There are well served by 7 exits from the underground Raffles MRT station excluding the direct linked way to some of the buildings sit above the station. These office buildings are the most sought after with some of the most prestigious business addresses in town. These include Raffles Place, Collyer quay, Battery Road and market Street. 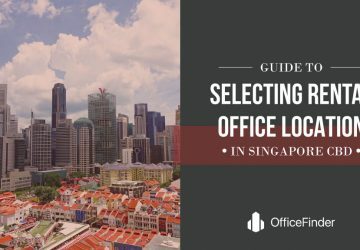 If you are considering office space near Raffles MRT station, these are the first group of buildings you should be exploring. Let’s look at the details of each building. To view details, map, photos and available office space in these buildings, please click on the building name. 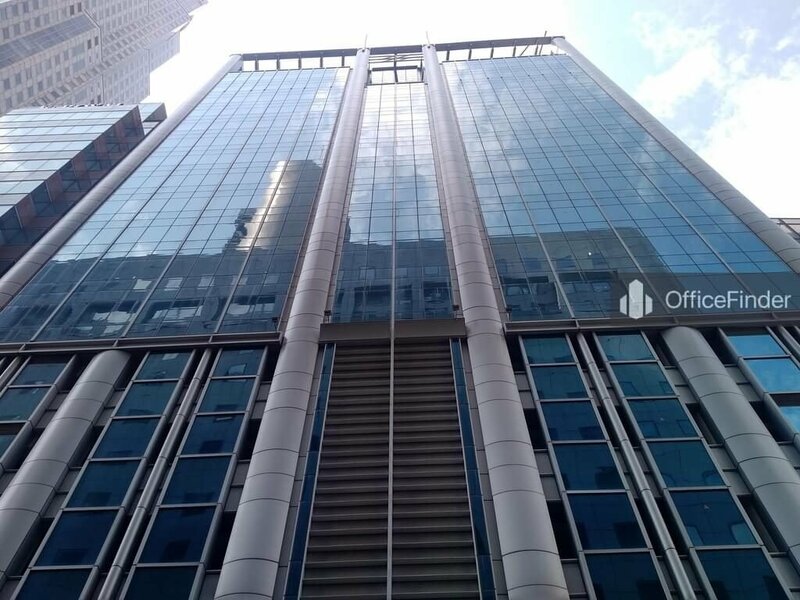 Ocean Financial Centre is one of the newest grade A office building sitting above the Raffles MRT station. The building was completed in year 2011 and consists of 43 floors. It is served by Exit c and E of the Raffles MRT station. Republic Plaza is one of the tallest office buildings in Raffles Place. 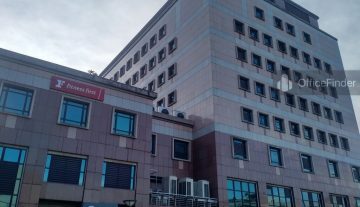 The building was completed in year 1995 and underwent retrofitting works to enhance the energy efficiency of the building. 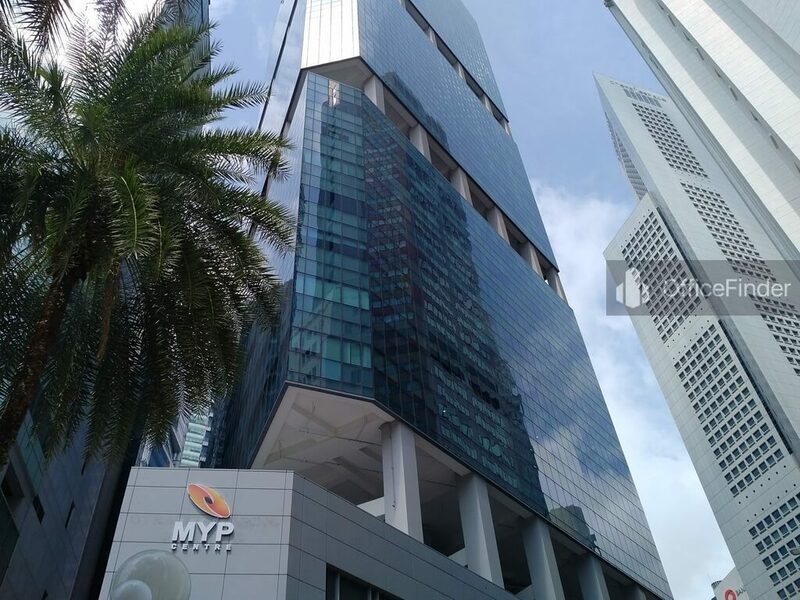 The 66 floors grade A office building has a direct connection from the Raffles MRT station via Exit D.
MYP Centre, formerly known as Straits Trading Building is another grade A office building located at Raffles Place. The building was redeveloped in year 2009 with 28 floors. It consists of two open terraces and 4 floors of car parking facility. MYP Centre is accessible via Exit B of the Raffles MRT station. 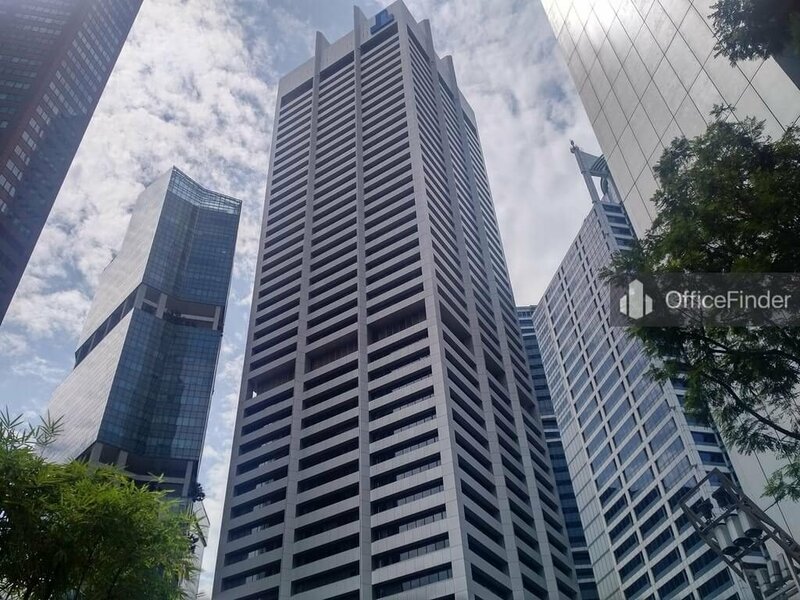 20 Collyer quay, also known as Tung Centre is one of the few office buildings at Raffles place with open views towards the Marina Bay. The building was completed in year 1984 and underwent major refurbishment works in year 2008. 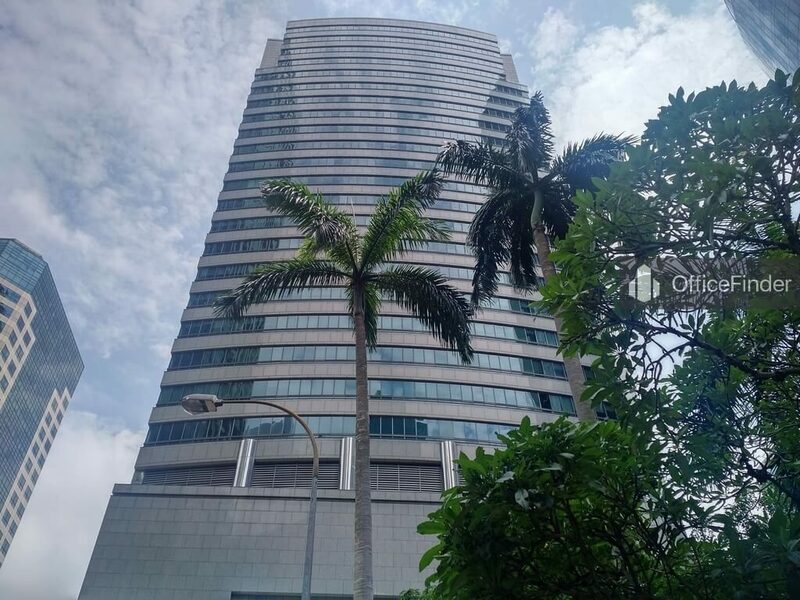 The 24 floors grade A office building is accessible via Exit B of Raffles MRT station and underground connection at Change Alley. 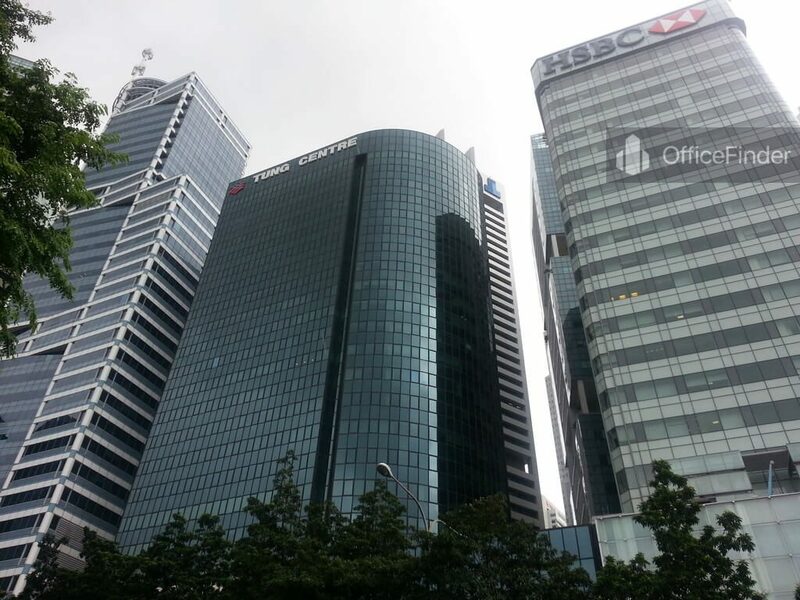 Another notable office space near Raffles MRT station is Bank of Singapore Centre. The building completed major refurbishment works in year 2011 and is one of the premium office buildings in the Raffles Place area. Spreading over 22 floors, bank of Singapore Centre is easily accessible via Exit A of the Raffles MRT station. There is sheltered walkway if you choose to get to the MRT station via One Raffles Place. 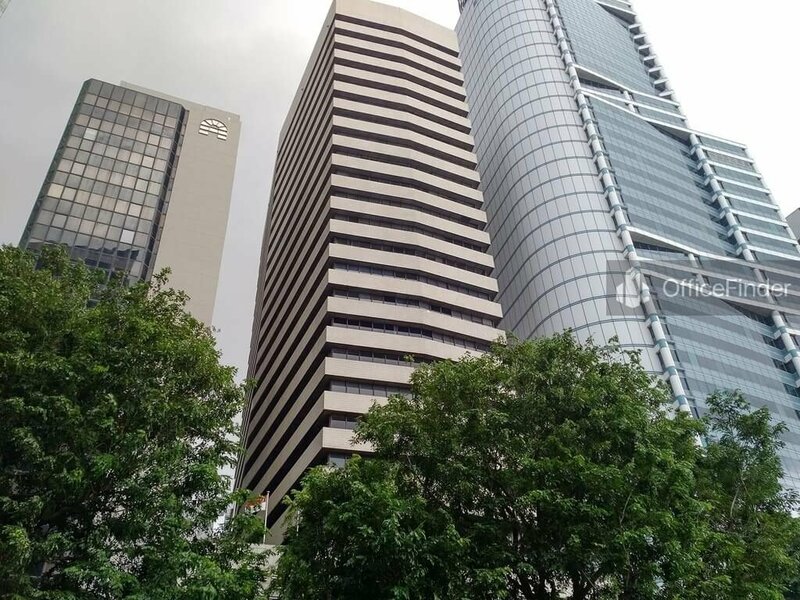 Named after its address, Six battery Road is one of the four office buildings located by the Singapore River at Raffles place. The 42 floors grade A office building was completed in 1984 and underwent a $92 million refurbishment works which completed in 2013. It is accessible via Exit H of Raffles MRT station which located at the corner of the building. 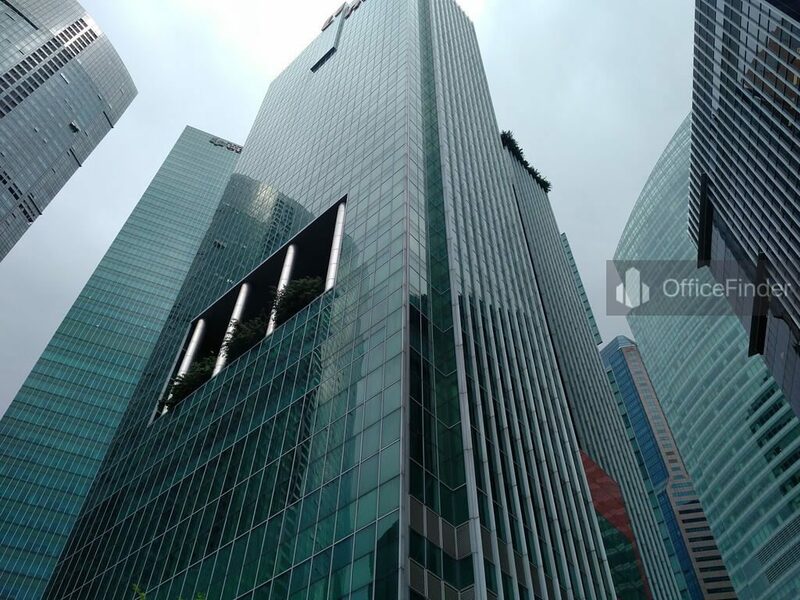 Bearing the prestigious business address of 1 Raffles Place, One Raffles Place is one of the most sought after office space near Raffles MRT station. Being one of the tallest buildings in Raffles place, One Raffles place offers grade A office space with panoramic views of the Singapore skyline. The building comprises a twin office towers of 62 and 38 floors and are integrated with a 5-storey retail mall. The office towers are accessible via Exit B of Raffles MRT station and the sheltered direct linked way at basement 1 of its mall. Strategically located by the Singapore River, UOB Plaza I & II were completed in year 1992 and 1995 respectively. The riverfront twin office towers offer exceptional views of the Singapore skyline and river. UOB Plaza is accessible via Exit G of Raffles MRT station located at the building. 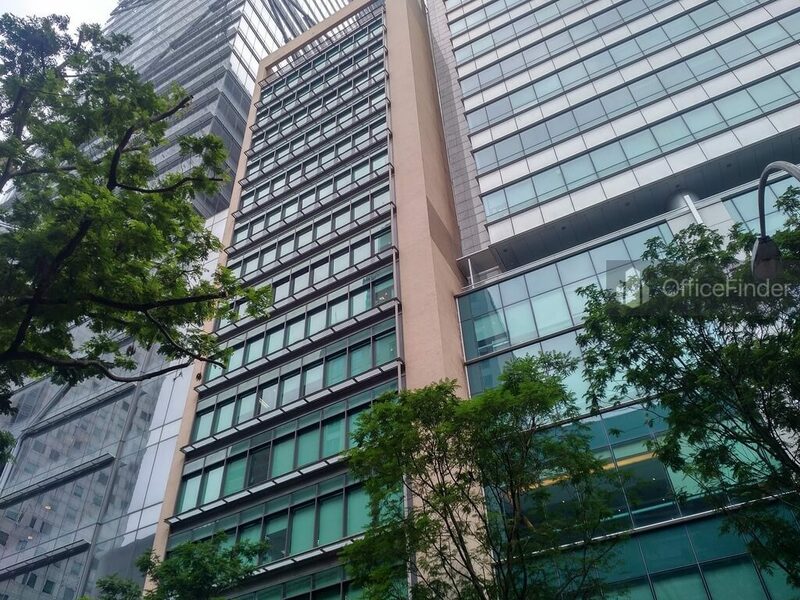 Another sought after office space near Raffles MRT station is Income @ Raffles. This is a 37 floors prime office building completed in year 1992. The building is fronting the Marina bay offering spectacular views. It is easily accessible via the retail podium connecting Chevron House which has a direct underground connection to Raffles MRT station at basement level. Another office building that sits above Raffles MRT station is Chevron House. The building comprises 33 floors was completed in year 1993. It shares a 4-storey retail podium with Income @ Raffles. The building has a direct underground assess to the Raffles MRT station via the basement retail level. Located adjacent to Chevron house is Singapore Land Tower. This 44-storey office building was completed in year 1980. The building underwent major refurbishment works in 2003. Singapore Land Tower is one of the few office buildings with the Raffles place address of 50, Raffles Place. GSH Plaza, formerly known as Equity plaza, is a newly refurbished strata office building located adjacent to Republic Plaza. The 28 floors office building consists of 2 retail levels completed major refurbishment works in 2016. It is accessible via Exit D of Raffles MRT station. 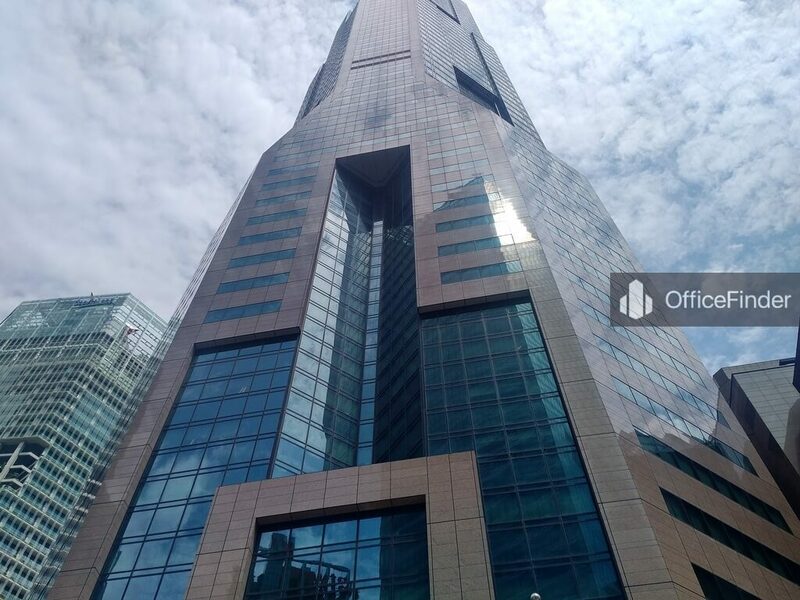 55 Market Street is a prime office building located between One Raffles Place and bank of Singapore Centre. The 16-storey office building underwent major refurbishment work in 2006. It offers affordable rent for businesses seeking an office space near Raffles MRT station. 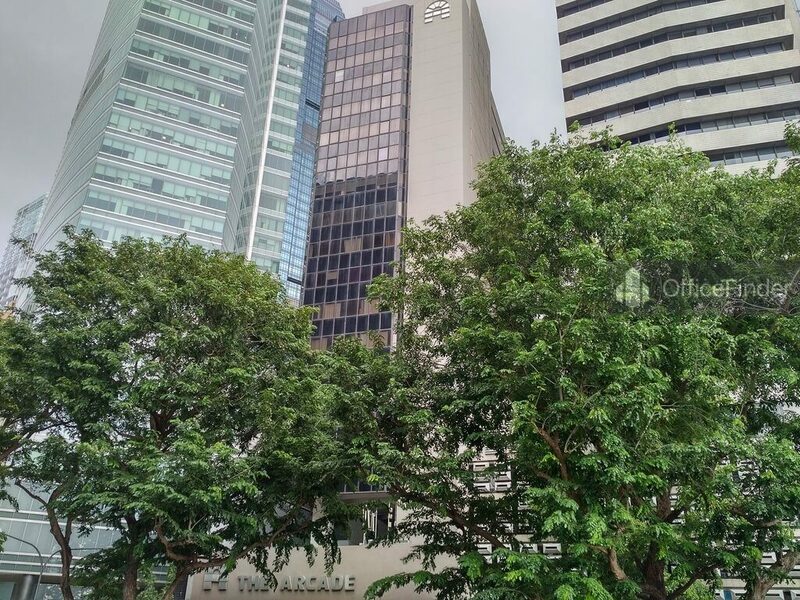 The Arcade is one of the office buildings offering affordable office space near Raffles MRT station. This 20-storey office building has an integrated 3 levels retail podium and was completed in year 1980. Apart from the affordable rent, it offers small office space from 450 square feet. The building is accessible via Exit A of Raffles MRT station and the sheltered linked way via Change Alley. 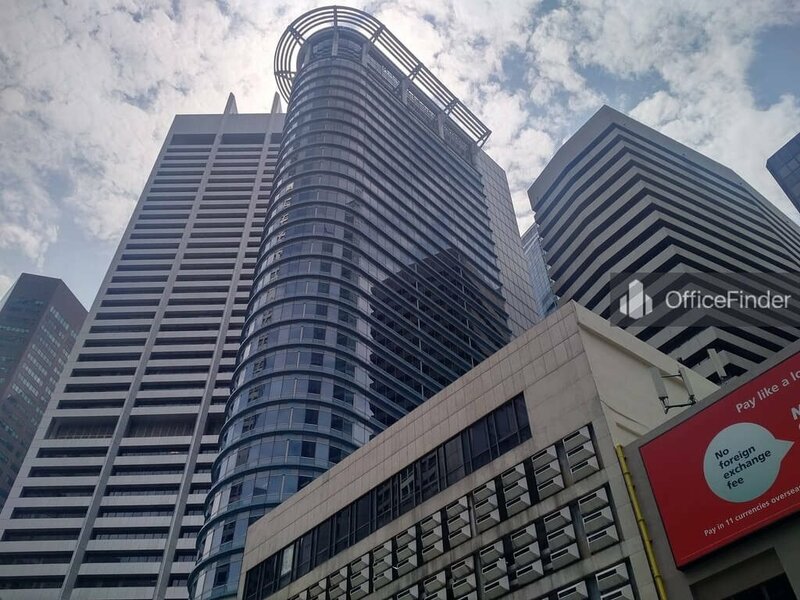 Clifford Centre is another office building offering affordable office space near Raffles MRT station. 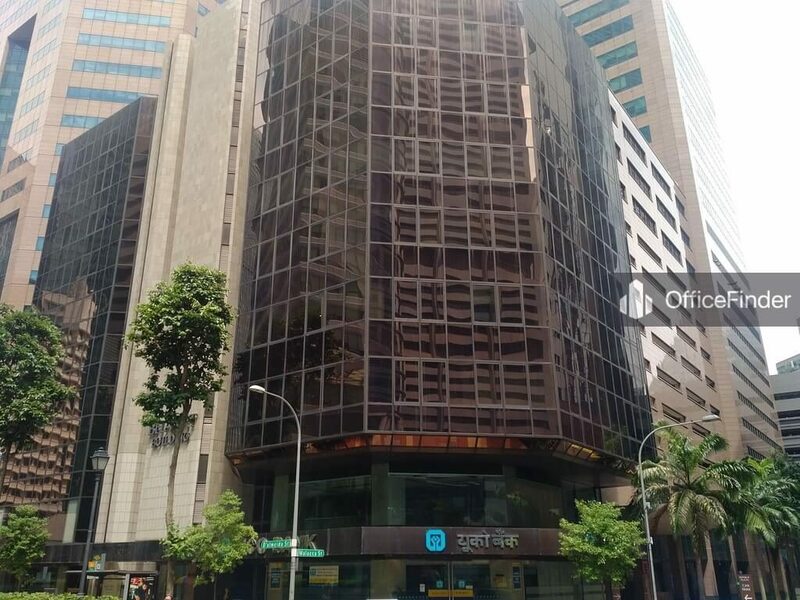 Completed in 1980s, the 29-storey building comprises a 3 floor retail space is suitable for companies with lower budget and require a presence in Raffles Place. The building is accessible via Exit A and E of Raffles MRT station. 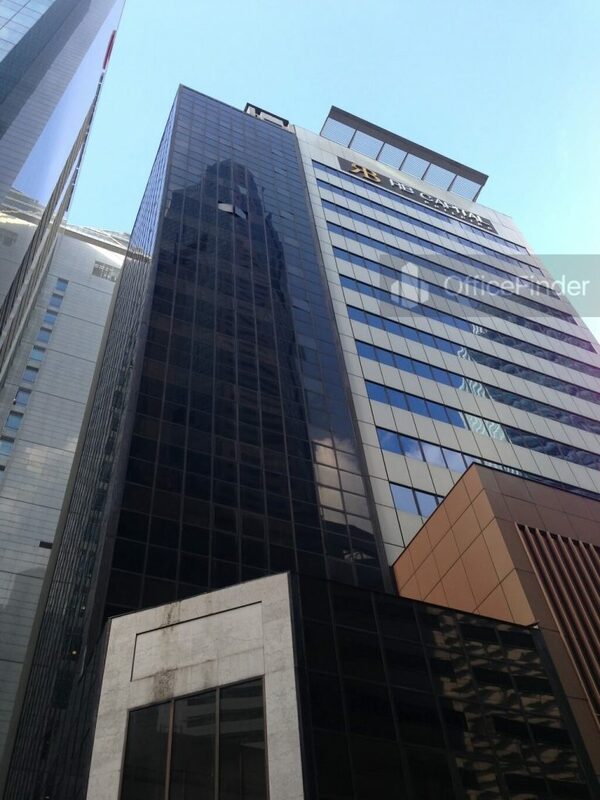 Located adjacent to the retail mall of One Raffles Place is RB Capital Building. The refurbished office building has a total floor count of 16. It offers small floor space office space near Raffles MRT station at reasonable rates. The building is accessible via Exit A of Raffles MRT station. Malacca Centre is a 16 floors office building near Raffles MRT station. It comprises two levels of retail space on level 1 and basement level. 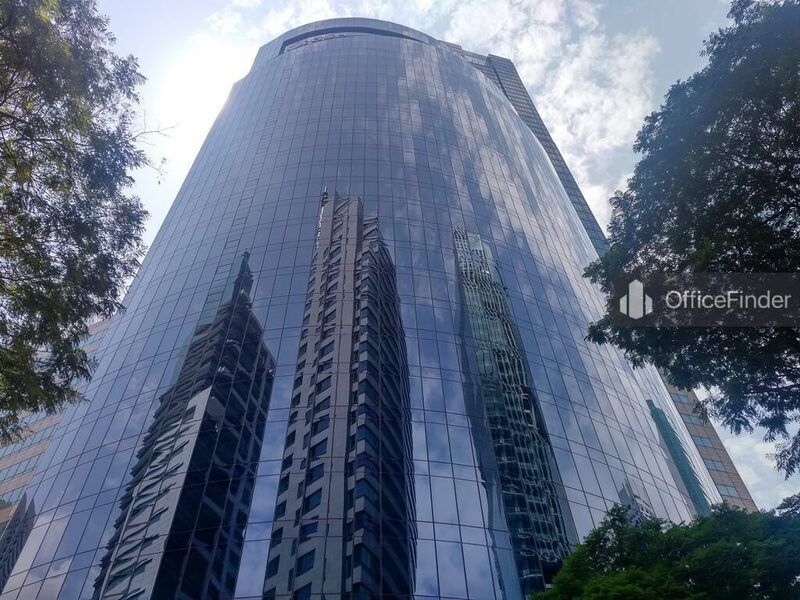 Malacca Centre is one of the smallest office buildings at Raffles Place and offer affordable office space near Raffles MRT station. The building is accessible via Exit A of Raffles MRT station. Being one of the smallest office buildings at Raffles Place, Bharat Building offers affordable office space near Raffles MRT station. It is strategically located at 3 Raffles Place, adjacent to Exit D of Raffles MRT station. 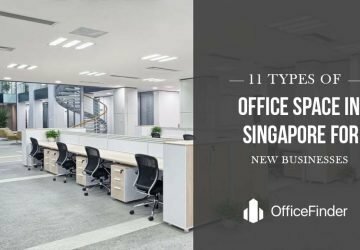 If for some reasons you did not find an ideal office space in the above list, here is another 10 office buildings with office space near Raffles MRT station for your consideration. 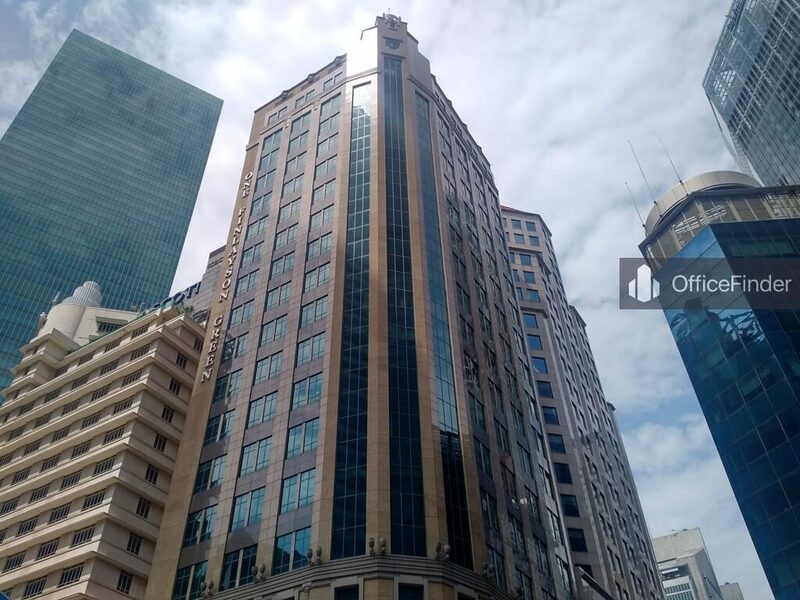 These office buildings are surrounding the heart of Raffles Place and easily accessible via the Raffles MRT station. OCBC Centre is a 52 floors office building with panoramic views of the city skyline. 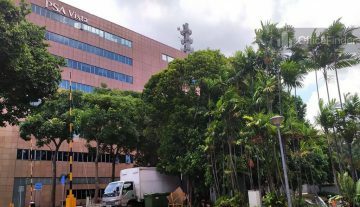 The building was completed in year 1976 and having two extended buildings namely OCBC Centre East and OCBC Centre South completed at a later date. 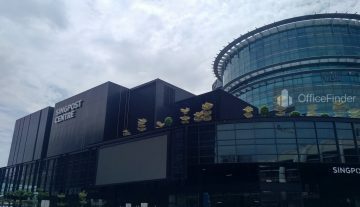 The building is about 5 minutes’ walk from Exit B of Raffles MRT station. Royal Group Building is a 19 floors prime office building. 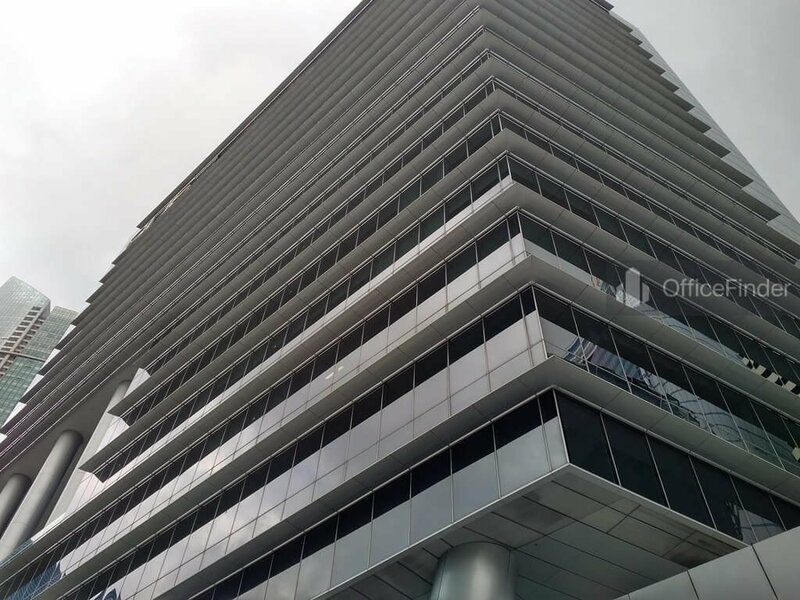 The building offers affordable office space near Raffles MRT station. It is about 5 minutes’ walk from Exit B of Raffles MRT station. 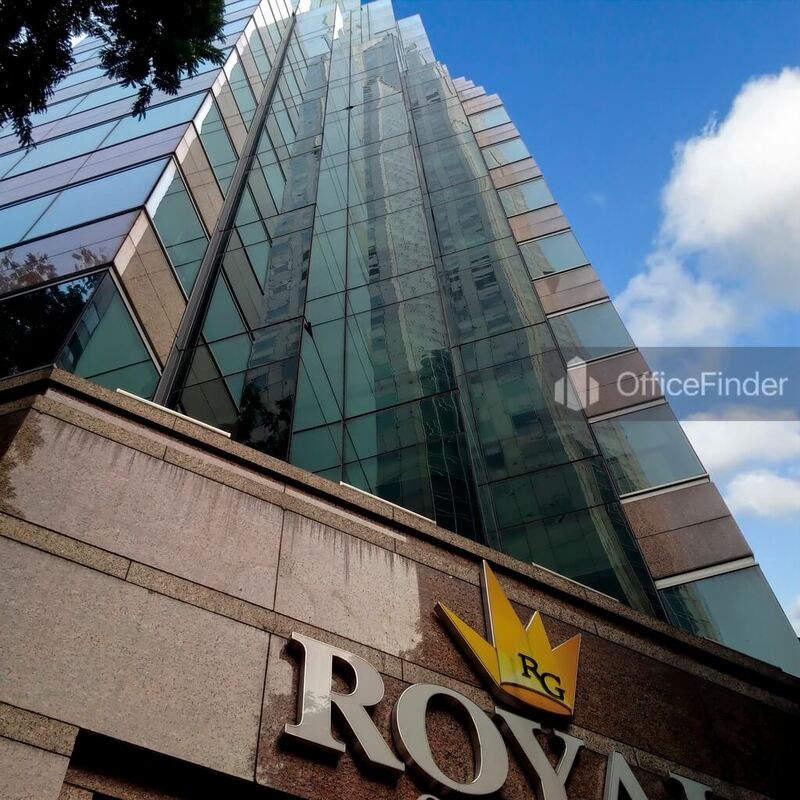 Located adjacent to Royal Group Building is Royal One Philip. This 16-storey office building is located at the junction of Philip Street and Chulia Street. It is about 3 minutes’ walk from Exit B of Raffles MRT station. Samsung Hub is a prime office building located opposite GSH Plaza. 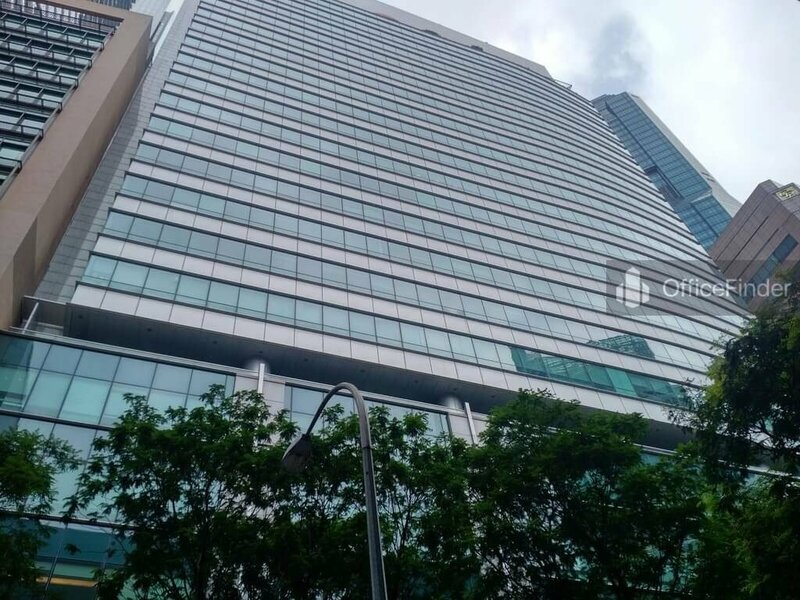 The 30-storey office building offers quality office space near Raffles MRT station. The building is about 5 minutes’ walk from Exit F of Raffles MRT station. Located adjacent to Samsung Hub is Prudential Tower. 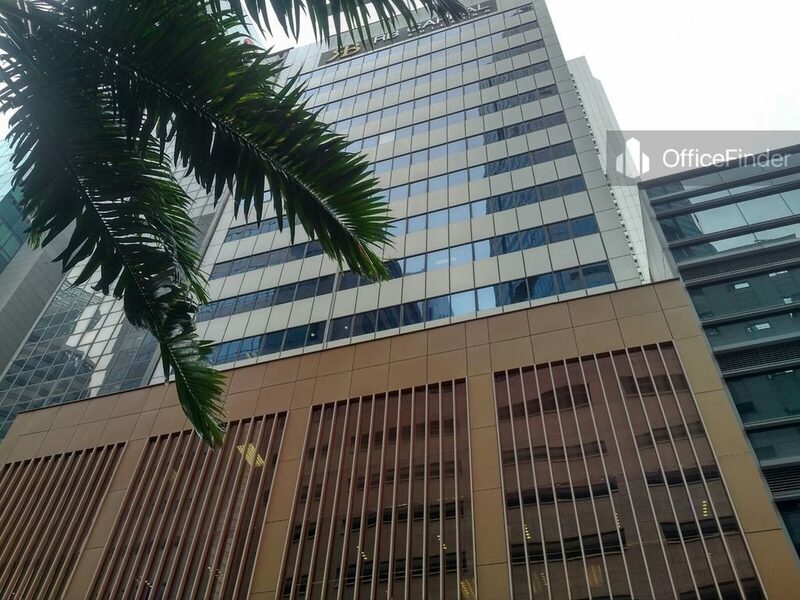 This is another prime office building with close proximity to Raffles place MRT station. 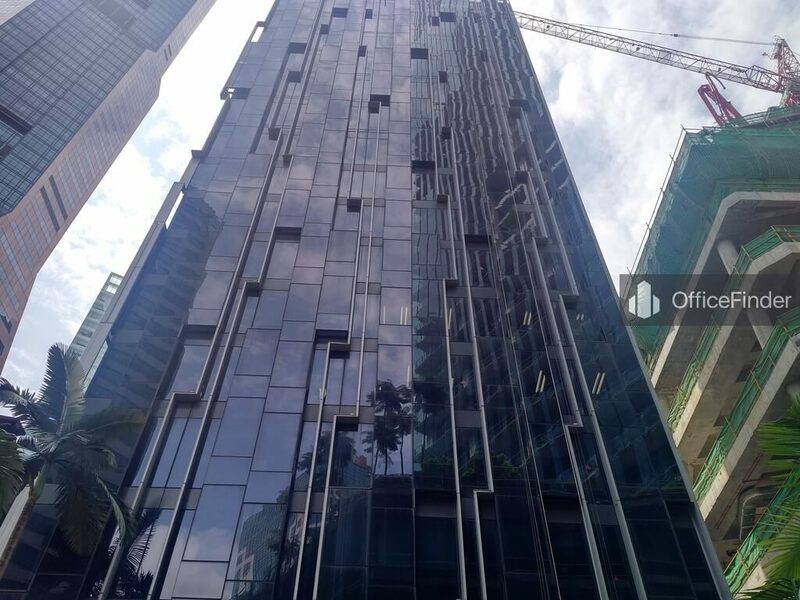 The 30-storey office building is about 3 minutes’ walk from Exit F of Raffles MRT station. 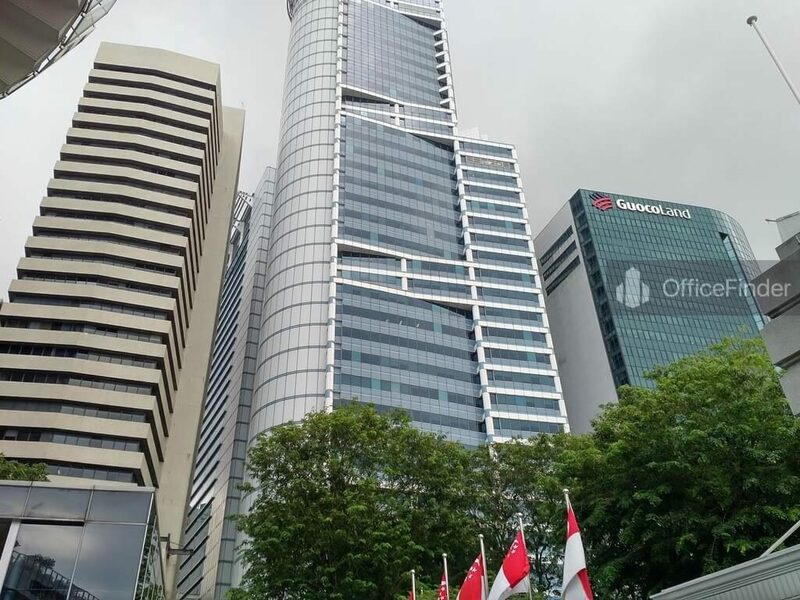 Located 3 minutes away from Exit F of Raffles MRT station is the mega office tower known as CapitaGreen. 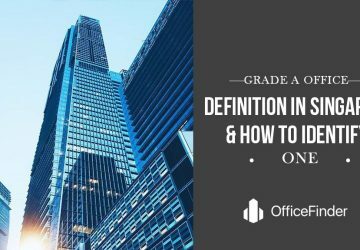 This is a 40-storey grade A office building with large floor plate of up to 25,000 square feet. It is one of the most sought after office buildings in this area. The building is ideal for MNCs to house their regional head office. The office building located next to Exit F of Raffles MRT station is Grace Global Raffles. This is a 15-storey office building completed its major refurbishment works in 2010. Sits above Exit I of Raffles MRT station is Lucrum Capital Building. 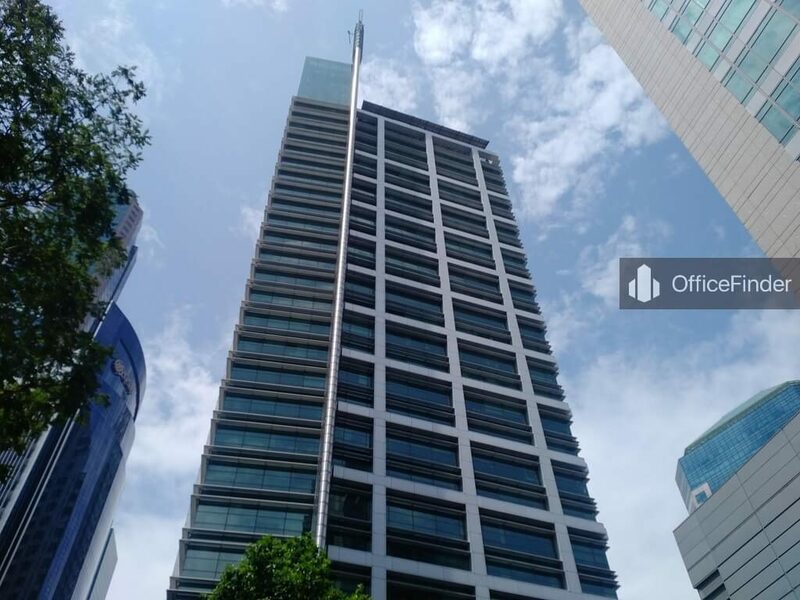 This 19-storey prime office building is prominently located at the junction of Raffles Place and Marina bay. It was completed in year 1994 and completed its major refurbishment works in year 2008. Located adjacent to OUE Bayfront is the prominent One marina Boulevard. This 32-storey grade A office building was completed in year 2003. It offers premium office space with views of Marina bay and the Singapore Coastal line. It has a direct underground linked way from Raffles MRT station. 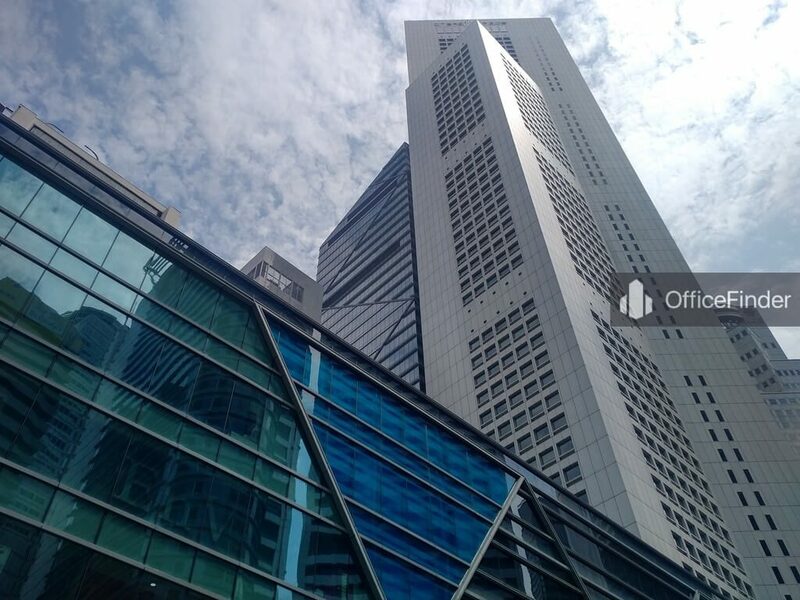 One of the most sought after office buildings with marina bay views is OUE Bayfront. The 18-storey grade A office building sits by the bay. The building is connected to other office buildings in Raffles Place via the OUE Link, a overhead bridge with retail space. It is also accessible via the underground linked way from Raffles MRT station. 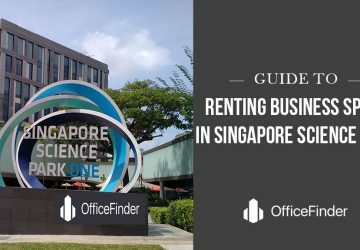 We hope the above list is helpful to you when finding an office space near Raffles MRT station. If you like this article, please share it on your social media now. 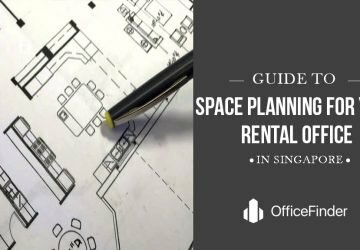 To view a full list of available office space near Raffles MRT station, please click here. 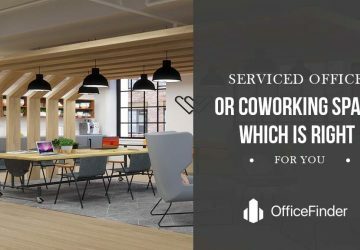 If you need help in finding an office space, let us recommend an office real estate agent with expertise in finding office space near Raffles MRT station.